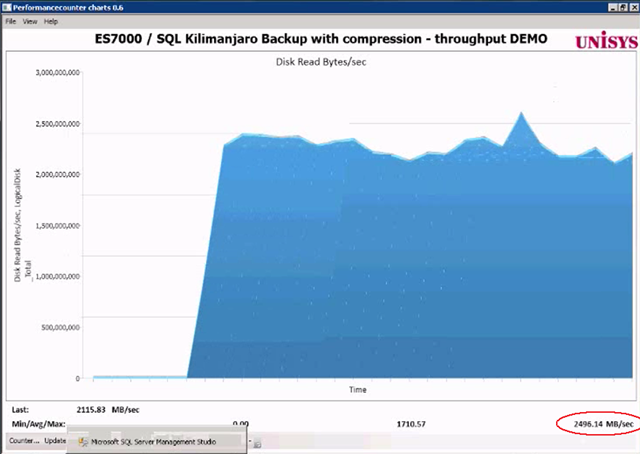 The SQL 2008 Database backup compression feature (which was introduced as a SQL2008 Enterprise Edition only feature) will become available in the SQL2008 R2 Standard Edition also ( SQL 2008 R2 Editions). I’m using the compression feature for quite some time now and really love it; it saves significant amounts of disk space and increases the backup throughput. And when such a great feature is available I would recommend you to use it! In the following walk through I will show you some simple tricks to speed up the backup throughput. How fast can we run a Full Backup on a single database with a couple of billion rows of data, occupying a couple hundred Gigabytes of disk space, spread across multiple Filegroups? Of course your server will use some extra CPU cycles to compress the data on the fly and will use the maximum available IO bandwidth. 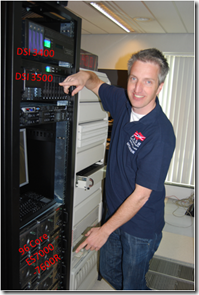 For that purpose I tested on some serious hardware with plenty of both: a 96 core Unisys ES7000 model 7600R with 2 DSI Solid State Disk units who deliver a total of 6+ GB/sec IO throughput. 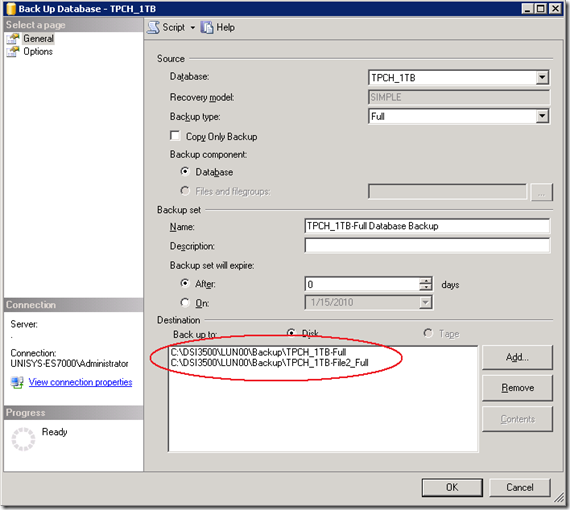 Database backup compression is disabled by default and it can be enabled through the SSMS GUI or by adding the word “COMPRESSION” to a T-SQL backup query. 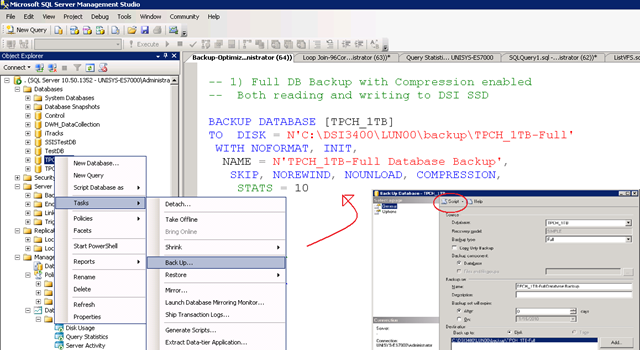 After you have selected the “Compress Backup” option, click the –Script- Option to generate the TSQL statement. 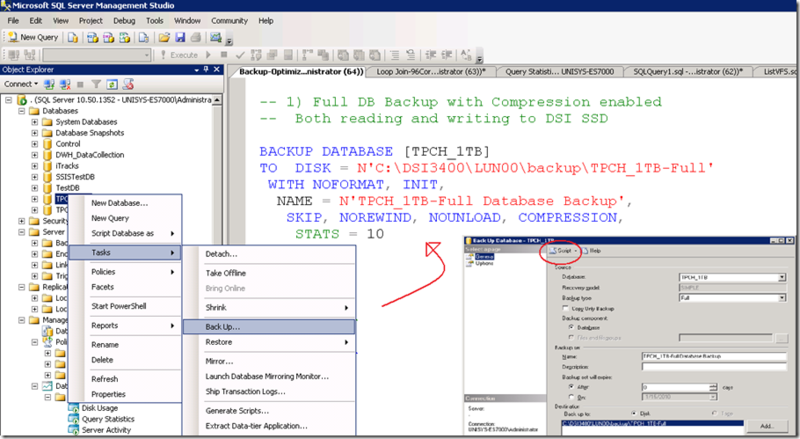 Please note that the word COMPRESSION is all you need to enable the feature from your backup query statement. 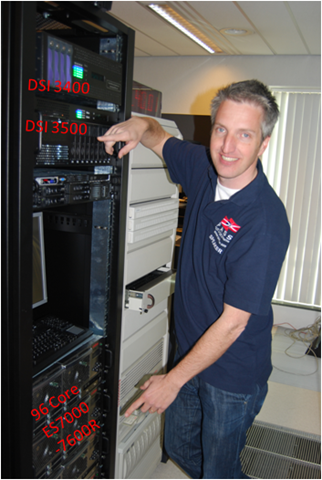 By running the above query, as a result, more than 1400 MByte/sec is read on average from both the DSI Solid State disks. That’s like reading all data from 2 full cd-rom’s each second. Not bad! The SQL Waitstats show that the number 1 wait_type is BACKUPBUFFER. The MSDN explanation for the BACKUPBUFFER wait_type is interesting: “the backup task is waiting for data or is waiting for a buffer in which to store data. This type is not typical, except when a task is waiting for a tape mount”. ehhh ok… since we are not using tapes , it means that this is not typical ! Let’s see what we can find out about the buffers. 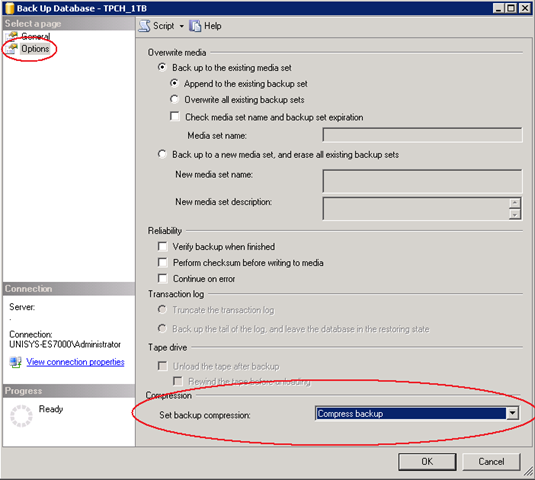 To get more insights in the backup settings there are 2 interesting traceflags. 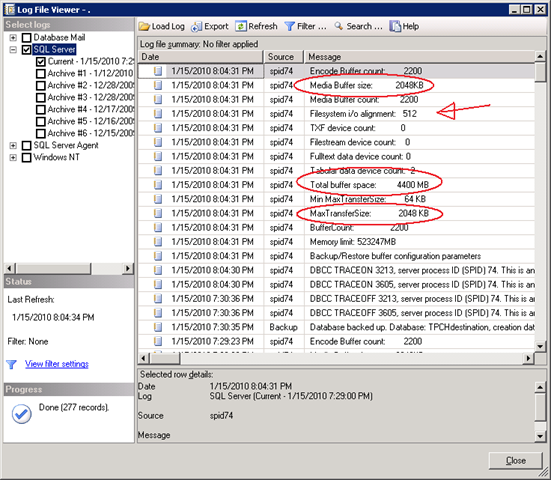 With these traceflags enabled the actual backup parameters are logged into the SQL “Errorlog “. The Errorlog show that our backup was using 9 Buffers and allocated 9 Megabyte of buffer space. 9 MByte seems a relative low value to me to queue up all the destination backup file data and smells like an area where we can get some improvement, (especially since we have we have 16 x 4Gbit fiber cables and 6+ GigaByte/sec of IO bandwidth waiting to get saturated ;-) ). Result of adding 8 more destination files: the throughput increases from 1.4 GB/sec up to 2.2- 2.4 GB/sec. That’s a quick win to remember! The SQL Errrorlog with the buffer configuration parameters shows that extra buffers are added automatically. The Backup/Restore buffer configuration parameters show some interesting parameters and values! 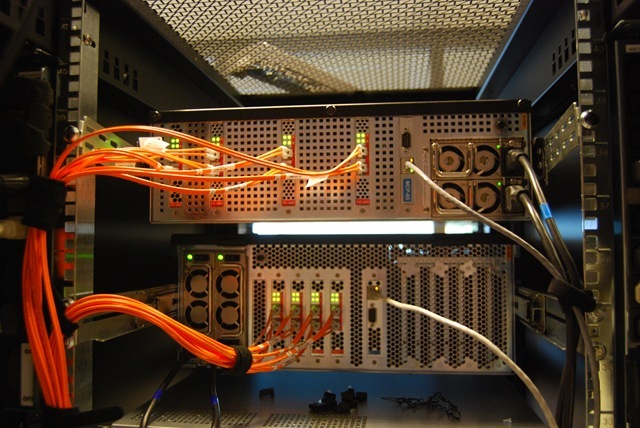 BUFFERCOUNT : specifies the total number of I/O buffers to be used for the backup operation. The total space that will be used by the buffers is determined by: buffercount * maxtransfersize. The output shows this is correct; with 49 buffers * 1024 KB = 49 MB total buffer space is in use. MAXTRANSFERSIZE : specifies the largest unit of transfer in bytes to be used between SQL Server and the backup media. The possible values are multiples of 64 KB ranging up to 4194304 bytes (4 MB). The default is 1 MB. BLOCKSIZE : specifies the physical block size, in bytes. The supported sizes are 512, 1024, 2048, 4096, 8192, 16384, 32768, and 65536 (64 KB) bytes. The default is 65536 for tape devices and 512 otherwise. Result: the average throughput is more then doubled, and the maximum peak throughput is up to 3939 MB/sec ! An interesting observation is that I was more less expecting to see that by changing the BLOCKSIZE would also show up in the log, but it doesn’t . and is now on a device with sector size 512. By specifying a large 64KB sector size instead of the default 512 bytes typically shows an 5-6% improvement in backup throughput. To estimate and check how fast you can read the data from a database or Filegroup there is a special option you can use to backup to: DISK = ‘NUL’. You only need 1 of those ! Backup compression is a great feature to use. It will save you disk capacity and reduce the time needed to backup your data. SQL can leverage the IO bandwidth of Solid State storage well but to achieve maximum throughput you need to do some tuning. By adding multiple backup destination files and specifying the BUFFERCOUNT, BLOCKSIZE and MAXTRANSFERSIZE parameters you can typically double the backup throughput, which means reducing the backup time-taken by half! It’s an amazing performance. good work. realy appreciated. Thought I would leave a note this time, having used this post over and over so many times the past 18 months. When I have discussions with customers on backup issues it is a great reference. 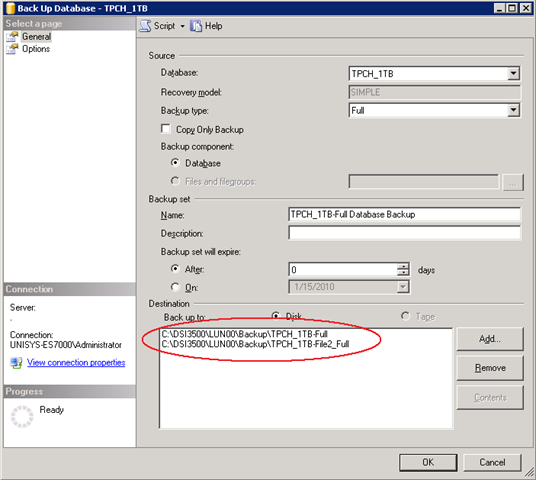 They often tell me that the SQL Server backup is slow and often list this as the reason why they use 3rd party tools. So far I have managed to turn over a good third of the customers I challenge, a pretty good success rate. But the credit goes to you and this excellent blogpost. I have seen some of your sessions on our own conference Miracle Open World and just wanted to give you credit for the excellent work you have done sofar. Hi Michael, glad to hear! 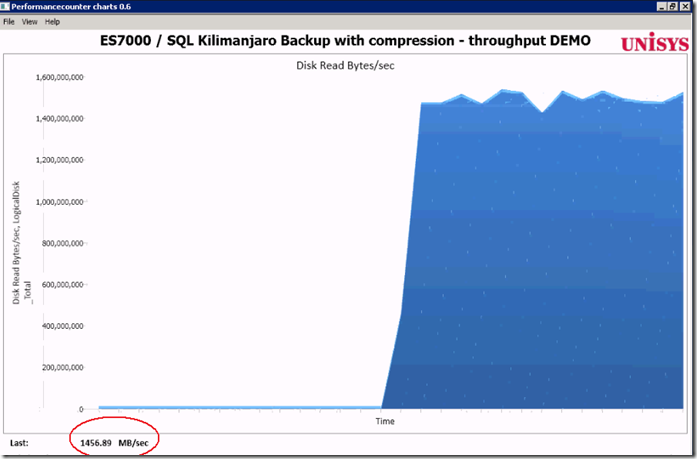 typically a backup task would run in the background with minimial interference to the overall server load; this post is just to show how fast you can backup/restore if needed! 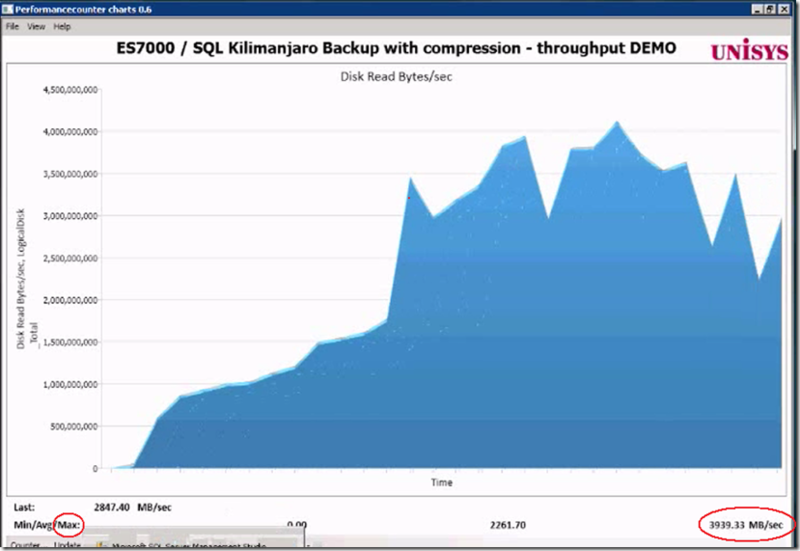 I’m trying to reduce a time backup on the specific database (Size 1To with 20Go for Filestream). Actually, if I used the standard backup parameter means without to define BUFFERCOUNT, BLOCKSIZE and MAXTRANSFERSIZE (only one file destination), it tooks 3H18. When I used the standard backup parameter but by adding multiple backup destination files (4 files), it tooks 2H00 (I won 1H18). Ok, now I tried to run the backup by adding multiple backup destination files and specifying the BUFFERCOUNT, BLOCKSIZE and MAXTRANSFERSIZE (BUFFERCOUNT = 2200, BLOCKSIZE = 65536 , MAXTRANSFERSIZE=2097152). I got error (I/O request taking longer then 15 sec to complete on file, where file is file that I was to backup). Another thing, I have a hight consommation of CPU % (100% sometime). Here some information about the Virtual SQL server (VMWARE 5.1) : W2K8 R2, SQL 2008 R2 Enterprise Edition 64 SP2, 16 CPU, 64Go of RAM with 50Go reserved for SQL. The disk size is 4To (Raw Device connected via Controller PVSCSI). I aligned the disk too (Starting offset 65536, Byte by cluster 65536, byte by sector 512). Could you help me to understand hight CPU usage and error ? Good to hear! 1TB/2 hours == 142 MByte/sec on average; this isn’t a huge number? Do you know how many spindles are allocated to your SQL environment? Have you tried lowering the IO pressure by allocating less buffers and less backup destination files? if you would like to dig deeper to understand where you spend the cpu ticks, please check the SQL waitstats + spinlockstats DMV’s. I know since the release of w2k8 R2, the partition alignement is set correct automatically but when I discussed with SAN support (like HITACHI) all the time they adviced to make the partition alignement. 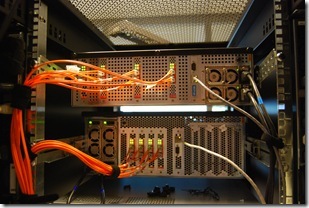 Anyway, we used EMC CX4 SAN STORAGE. Basically, I have to ask more information about Lun (how many SPINDLE, which kind of disk architecture, brocade bandwith, …), is it correct ? When I defined multiple backup destination files (4 files) but not specified the BUFFERCOUNT, BLOCKSIZE and MAXTRANSFERSIZE I had not CPU problem. Just thought I’d let you know that tuning the backups up to run this fast caused some issues for me. 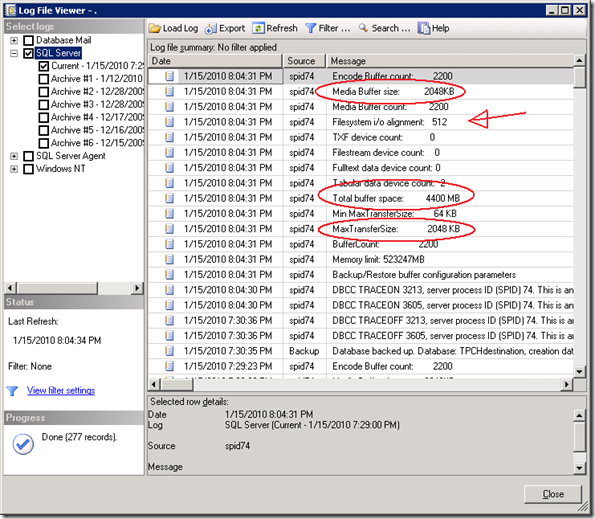 Using the buffercount of 2200 resulted in saturation of the data drive, which caused SQL to report 15 second waits on IO. I lowered buffercount to 500 and eliminated the errors, but still had a great improvement in backup time by a factor of 6.